Today's Draw: Duration from the Tao Oracle by Ma Deva Padma. Think back to your first memories of yourself...what was true then that is true today? Is there a part of that you suppress because it just wouldn't fly with your family or friends? Do you know who you were born to be? This week's theme is all about the ego—what it is and how to move past it. I had a bit of a hard time when I first came across the idea of ego in my spiritual studies. To me, ego meant "being full of yourself". But in a way, in spiritual terms, it's the opposite. It's more like being full of everything but yourself. Ego is that part of you that seeks external affirmation. That part that's motivated by external stimuli. And that part that gets your cues on how to be from external sources. And by "external", I'm talking about anything outside of yourself. So ego is that part of you that measures yourself by your title, bank account or the way others see you. Your ego cares whether or not others approve of you. It gets restless when a new technology comes out that everyone "should have". It worries about wrinkles and gray hairs. And when it's not conforming to social norms, it's rebelling against them. For better or worse, the ego drives you based on what society deems correct, what others will think and what others expect from you. For anyone on a spiritual path, the time will come when the ego gets so cumbersome that you cannot continue moving forward with it on your shoulders. It puts distance between you and your higher self or authentic self. For many of us it's hard to even know what's genuinely authentic to us because it's hard to tell where our parent's dreams for us end and we begin...or where society's norms end and we begin. Are we who we are because we consciously chose it? Or were we shaped and molded by the expectations placed upon us? And why is that even important? As today's card shows, it's important because when you are living in your authentic self, no matter what happens outside you, you will never lose sight of yourself. If you lose your job, you won't lose your identity. If you lose your home, you won't lose your value. If you lose your looks or your spouse or your health, you won't lose your "self". No matter what happens outside the mountain, the mountain remains unchanged. It is what it is, what it always was and what it was always meant to be. It's also important because, when we're aligned with our higher selves, we have more personal power. We're better able to serve others. Things fall into place and become less of a struggle. We stop being controlled and we stop controlling. We no longer need to be right or understood. And when we detach from needing to be liked, accepted and understood, we free ourselves from the fears that drive inauthentic decisions. Be honest with yourself. How much of yourself is the way it is because it's what was expected of you? Or because it's proper...or practical? Or because you find people like you better this way? Or because you're rebelling against conformity? Or because you seek to control? Or because it's what you can be successful at? These are all externally focused motivations. Now what parts of you are authentic to you...the you you were born to be? That's a really hard thing to excavate! But valuable to know. Can you imagine dying without ever knowing who you were? 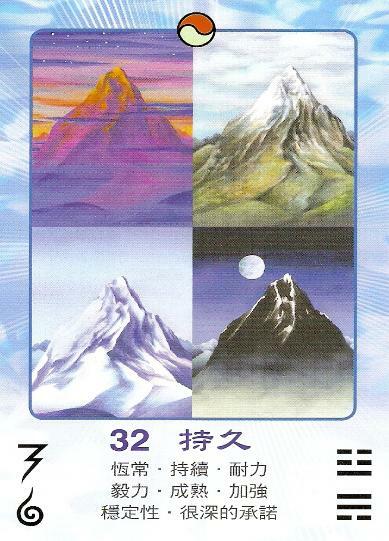 Like the mountains in the card, our authentic self is that part of us that is eternal and unchanging....solid and strong. It is at one with nature and the universe...a part of the "god" organism rather than separate from it. Ego tells us that everything worth having and being is outside of ourselves and just within reach if we just do more, be more, get more. When we shed that ego, however, we see that everything worth having exists within us. We've already arrived.